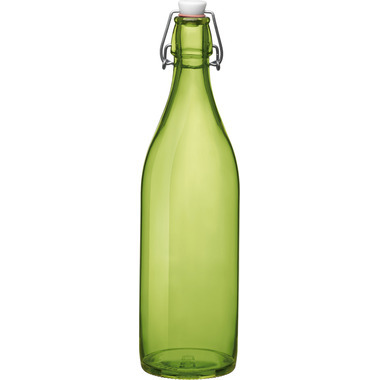 The Giara collection of glass bottles features different colours reminiscent of sparkling Italian sodas. This Bormioli Rocco glassware uses organic sprayed colours that won't chip or fade. These glass bottles are a sensible, ecological option, and the Giara collection features non-porous, dishwasher-safe glass that can be used without restrictions. Enjoy your favourite concoction in style and store it away safely with the tight-fitting stopper that prevents leaks. A welcome addition to any picnic table or dining area, these bottles will help all home chefs prepare infused water, soda, or oil. Ready, set, sparkle!